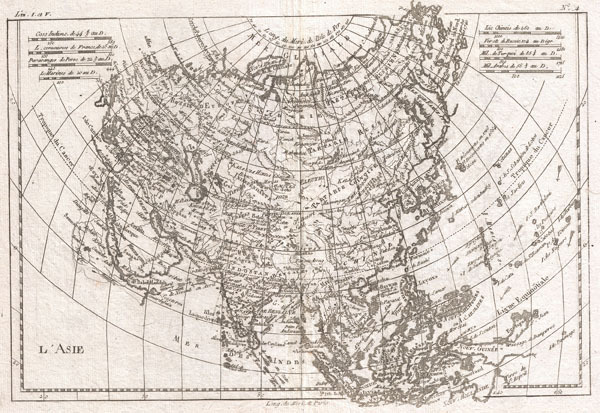 A fine example of Rigobert Bonne and Guillaume Raynal's 1780 map of Asia. Offers considerable detail considering the size, showing the tradewinds in the Pacific and Indian Oceans as well as numerous Silk Route cities in Central Asia. Highly detailed, showing towns, rivers, some topographical features and political boundaries. Drawn by R. Bonne for G. Raynal's Atlas de Toutes les Parties Connues du Globe Terrestre, Dressé pour l'Histoire Philosophique et Politique des Établissemens et du Commerce des Européens dans les Deux Indes.